1. Login to your HappyFox account and navigate to your tickets page. 2. Click the ticket which you would like to tag. 3. In the ticket details page, click “Add Tags” on the "tags" section in the right panel. 4. Type in the relevant tags, each separated by a comma and then click the Add Tag button. 5. The tags you have added will be listed in the Tags section of the ticket details page. 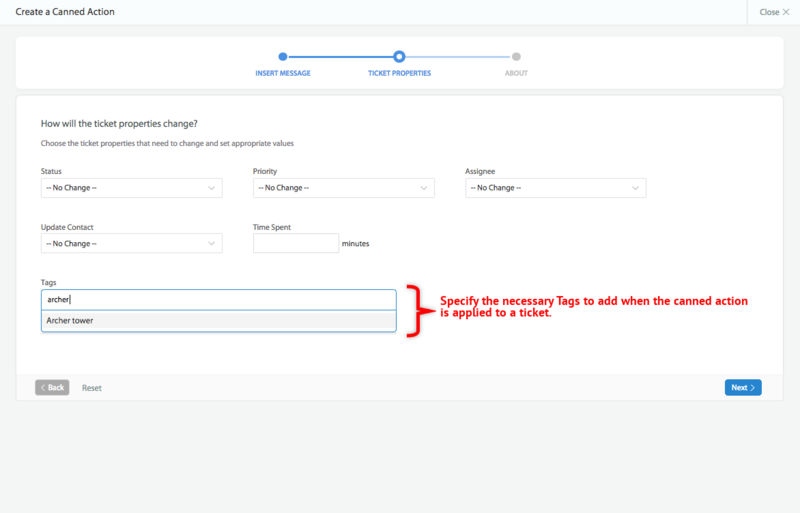 Add tags via Canned Actions. 1. To do this, navigate to Automate >> Canned actions. 2. Click + to add a new Canned action or 'edit' to edit an existing Canned action. 3. In the "Ticket Properties" train, specify the tags that need to be added when the canned action is applied on a ticket reply. 4. Fill in other details of the canned actions appropriately and click " Create a Canned Action". Note: Every time this canned action is applied on a ticket, the ticket will be tagged with the tags given in the canned action. 1. Navigate to Automate >> Smart rules. 2. Click + to add a new smart rule or 'edit' to edit an existing Smart rule. 3. In the "Choose Action" train, select "Add Tags" and specify the necessary tags that need to be automatically added. 4. Specify smart rule conditions, associate categories and fill all other details appropriately and click "Create a Smart Rule". Note: Whenever this smart rule is triggered, the tag will be added to the ticket.